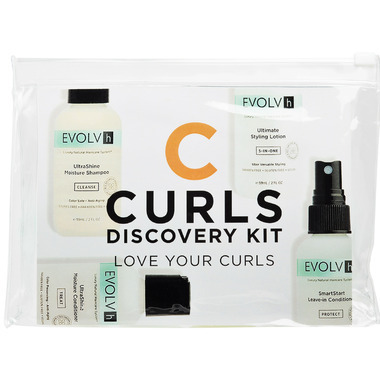 The EVOLVh Curls Discovery Kit is a complete all-natural system that makes it easy to create beautiful, soft ringlets and reduce frizz without any "crunch". The UltraShine Moisture Shampoo and UltraShine Moisture Conditioner moisturize and condition the hair to prepare for the perfect curl. The SmartStart Leave-In Conditioner is a game changer for reducing frizz, adding moisture and softness without added weight. 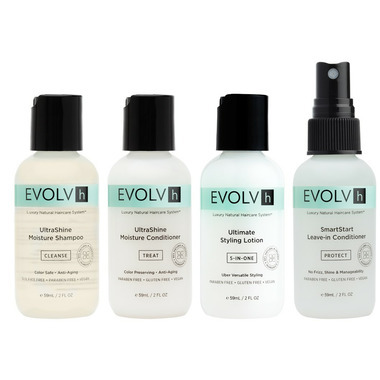 The Ultimate Styling Lotion has been dubbed "ringlets in a bottle" by stylists and clients. The 5-In-One botanical formula creates volume, holds style, de-frizzes, adds shine and or defines curls into smooth ringlets. 1. Cleanse and Treat hair with UltraShine Moisture Shampoo and Conditioner. 2. Wrap hair in soft t-shirt or towel to remove excess moisture. 3. Mist hair liberally from roots to ends with SmartStart Leave-in Conditioner. 4. Apply Ultimate Styling Lotion, distributing product evenly down the hair shaft. Use fingers to create desired ringlet shape. 5. Let air dry as much as possible. Avoid excessive touching of hair. One or two soft “scrunches” are OK but don’t overdo it. Save your money. For the money, this is worst purchase I have ever made for hair. I tried once and threw away. Drug store $2 shampoo / conditioner is better. These products definitely made my hair smoother and shinier but they didn't do much for my curls - other and cheaper products work just as well or better at defining my curls. This kit does NOT contain the curly hair products, but does contain what is described in the description online. That being said, I have a LOT of curly hair and these products work better than any other natural hair products I have tried.